I wonder how many more unreleased projects and music there might be waiting in his vaults, time for Digital Aphrodisiac maybe? James Stinson is most definitely living on through his music and gaining more aliases and mystery too. Both the 2LP reissue of Drexciya's Grava 4 (2002) album and The Other People Place's 12", Sunday Night Live at the Laptop Cafe, on Clone Aqualung are both now available to order from the Clone shop and elsewhere. According to Leisure System's Bandcamp page for Dopplereffekt's Cellular Automata album, 'Our initial run of copies have sold out on pre-order. A restock is in progress, however it means that delivery of LP orders made after March 28th may be delayed until May 29th, 2017. Vinyl purchases still include an instant download of the album on release date. Our apologies for the inconvenience!' They have some images of the album there now and you can play the album's title track. For everyone who ordered before 28th March, the release date is still April 7th. Also, if you go the the Leisure System Facebook page you will find 3 short videos of tracks from Dopplereffekt's Cellular Automata album and all the tracks from the album are available to play on the Bandcamp page now. In celebration of the first Dopplereffekt LP in ten years, Rudolf Klorzeiger and To-Nhan delivered a special mix of records from their personal collection tonight on Red Bull Radio. A new Arpanet live show has just announced for Berlin, Germany on 21st July. The venue, OHM, is located in the former battery room of a disused power plant. 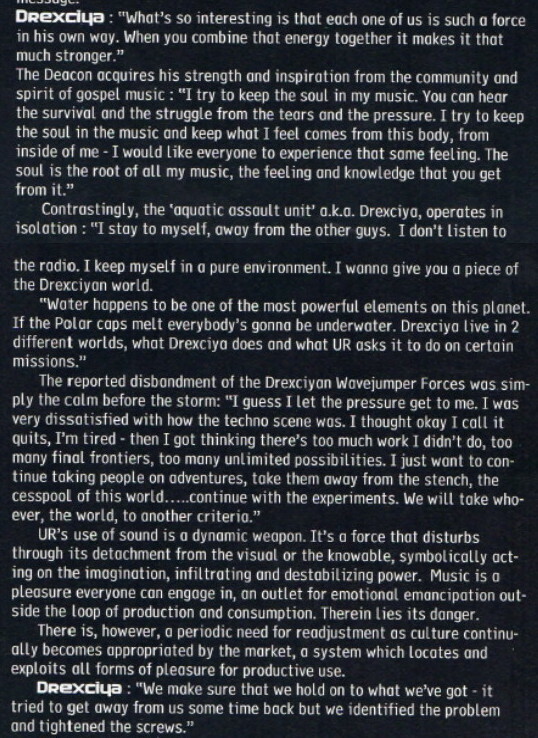 I've made a scan of the Drexciya entry from the now very rare book, Techno: The Rough Guide by Tim Barr from 2000. You can see it (and much more) in the 2000 folder at this public GoogleDrive link. This is a great little reference book I bought back in the day, which even though it looks very populist, covers pretty much everyone you would expect, there's even a Dopplereffekt entry. They used the very revealing un-sourced quote above, and the entry must have been written before they returned with Neptune's Lair in 1999. 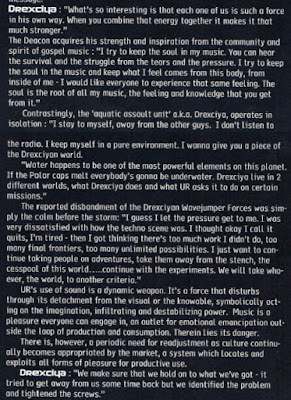 It's interesting to note that even for just their UR period of 1992-1997, Drexciya were already held in very high regard. This a new radio show by Bob Thompson from the UK station, Purple Radio, which looks at the order of Drexciya's Storm Series and even references my own theory about this from 2005. It's an enjoyable listen with some great music and interesting insights. There are 3 Drexciya themed mixes by this German DJ and longtime Drexciya fan, MRJN, over at Hear This, well worth a listen. VLR have a new Drexciya mix, Seven Storms - The Dimensional Waves Transmissions, up on their Soundcloud. Check out the rest of their Soundcloud account for other Gerald Donald and Drexciya themed mixes, quality stuff as always. This is a new show from France's 'The Beat Radio Show', dedicated to James Stinson. I love their introduction and there are some great tracks selected. Back in November 2016 they did the same type of show for Gerald Donald. I think the name of the DJ of both shows is Stephan Bomba. 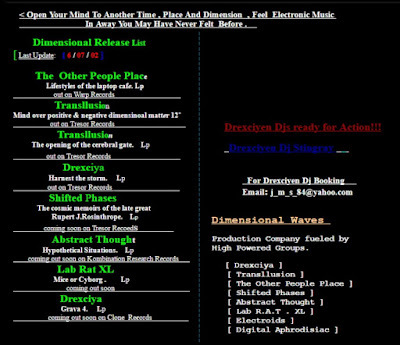 I shared a few videos recently on the DRL FB page that may have been influences on Drexciya or coincidently sound like them. Check out 'Frequency 7' by Visage, it's hard to believe this amazing track is from 1981 (there is even a vocal led version from 1979) and was just a B-side. 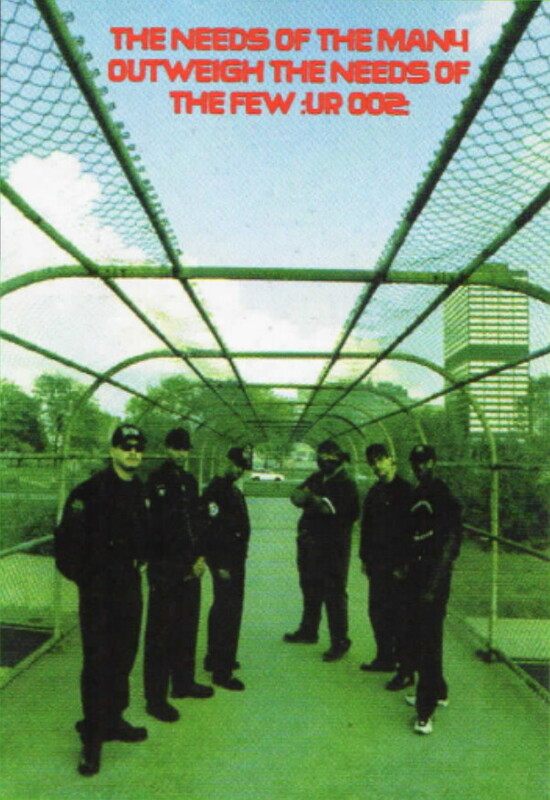 This was a big tune in Detroit at the time and was championed on radio there by The Electrifying Mojo. I can certainly hear some elements of early Drexciya and the one-off projects, L.A.M. and Glass Domain. This track from 1982, by the French studio duo of Francis Rimbert and Frederick Roussea sounds kind of like a prototype Air maybe, their label, Record Makers, should reissue this one for sure, it's so close to some of Heinrich Mueller's signature sounds. 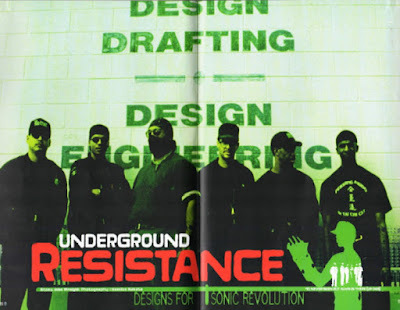 Very many thanks to one of my readers who sent me a scan of the Underground Resistance article from the Summer 1999 issue of the now defunct UK magazine, Straight No Chaser. 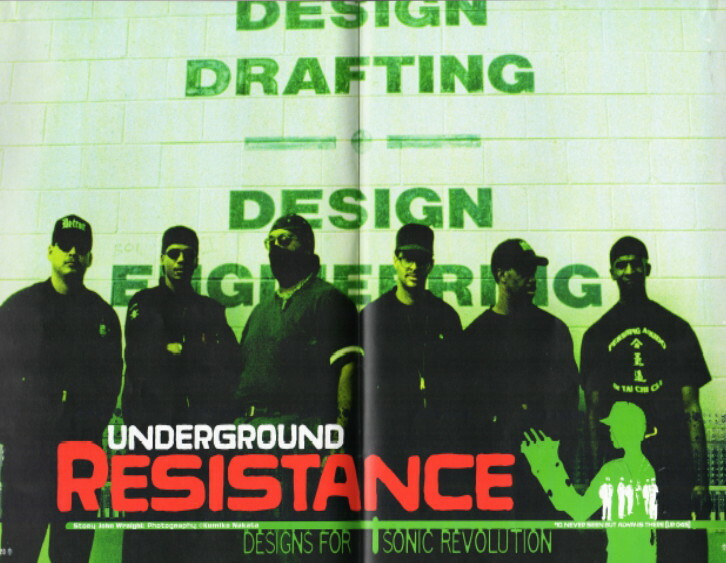 Here I've included just the Drexciya quotes and images, including a new image (to me) of James Stinson standing with other UR members. This inspiring piece was written by Tsutomu Noda and originally published in Japans's Ele-King magazine. As I've never seen the original online before and think it's well worth sharing, I've created a public GoogleDrive folder to host the full scan (look in the 1999 folder and use link below). From now on I will also be adding other Drexciya/Heinrich Mueller press articles, record info sheets and any other printed matter pertaining to them in this folder for all to share and find more easily (please send me anything I don't have). I also found a great interview with Tsutomu Noda by Derrick May. Anyone who's interested in Drexciya's seven album Storm Series and the puzzle that eight albums were actually released between 2001 and 2002 will be interested in a new nugget of information that has come to light from Serge of Clone Records. Previously there has been no known way to tell which album is the odd one out and James Stinson never identified all of the Storm Series albums when interviewed (he only confirmed Harnessed The Storm, The Other People Place,The Opening of the Cerebral Gate and Abstract Thought). In 2005 when I looked in depth at all eight of the albums I speculated that Grava 4 was the odd one out but did find that it very much followed on conceptually and was closely related to the Storm Series. This is how I summarised it at the time, if you have (a lot) of time you can click on each album (including Grava 4) and read my original posts as I followed the Storm Series. What I found is far from definitive and it includes my own assumptions and speculations but it was an honest attempt to figure it all out for myself and share these thoughts with other fans. I've compiled everything that James Stinson said on the matter as well about half way down this post. #1 Drexciya - Harnessed The Storm: Drexciya get metaphorically kicked out of the paradise of their underwater home because they forget the meaning of life and so begin a journey of rediscovery. #2 Transllusion - The Opening of the Cerebral Gate: They begin this journey by looking within and exploring their mental dimensions. 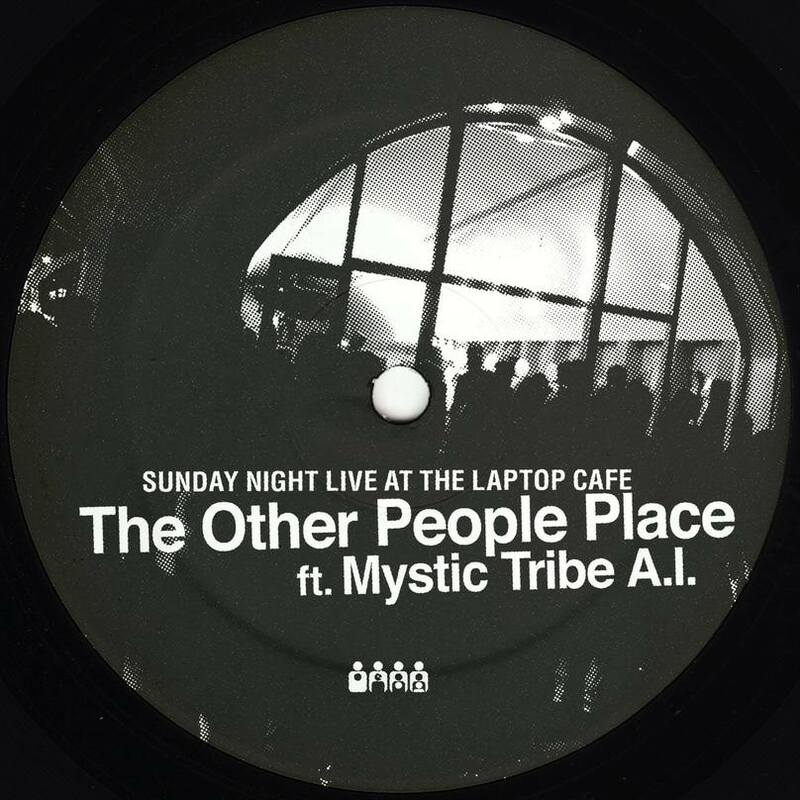 #3 The Other People Place - Lifestyles of the Laptop Cafe: Next they follow love in all its forms. #4 Abstract Thought - Hypothetical Situations: They further stretch their minds by exploring 6 hypothetical situations. #5 Lab Rat XL - Mice or Cyborg: They prepare their bodies for the physical trip home by carrying out 6 biological exercises. #6 Transllusion - L.I.F.E. : They ultimately learn to overcome their fear of death, how to roll with the punches of life and remember the meaning of life, evolution. Paradise is regained at this point but now they go further. #7 Shifted Phases - The Cosmic Memoirs of the Late Great Rupert J. Rosinthrope: They can now begin the physical journey through space which ends in their final flux before they arrive at their long sought ultimate utopia, the Drexciya Home Universe they find in Grava 4. 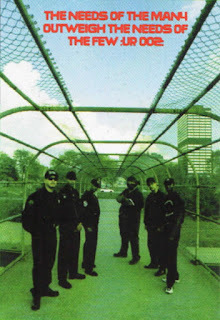 When Clone recently reissued Grava 4 they refereed to it as being one of the seven albums in the Storm Series. While I personally didn't agree with this I accepted what they were believed and agree that it was closely related. Someone referring to my list posted a comment on the Clone FB page that Grava 4 wasn't one of the Storms and Serge replied that “Grava 4 is most definitely one of the 7 storms. The list on the website you are referring to is speculative.” This is true about the list, I've always stressed it was my own opinion and left it open so that everyone could come up with their own combination of those 8 albums, deciding which one is the odd one out, what order they should be in and what the meaning of the series is etc. I'm happy to have this alternate order to consider, DRL for me has always been about sharing the information/research; anything that gets people thinking and looking deeper into this rich subject will always be a good thing. In this case it's up to each reader to decide what they think about this new information from Serge, however, even he does remind us to always question the information from the label. In this spirit then, if you do follow his line of thought there are further mysteries to consider. If you go by the 'Dimensional Release List' to identify the seven albums in the Storm Series, which I have always taken to be a general list of upcoming releases (it appears to be only the latest update with more to follow and it lists the first Transllusion 12” as well), you will see that the second Transllusion album, L.I.F.E., which came out on Rephlex in 2002, is missing from it. This implies that this album is the odd one out and should be seen as separate from the Storm Series. 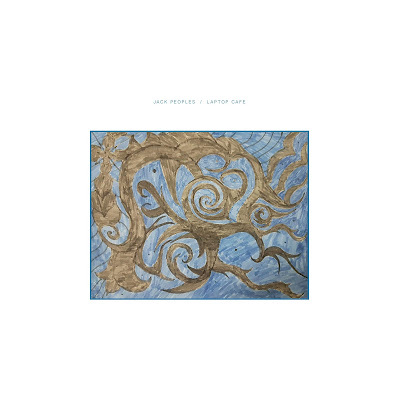 However, if you look at the label artwork for this album and its accompanying 12”, Third Eye, you will find it states, 'Transmitted by Dimensional Waves' and gives the ridedimensionalwaves email address as well. 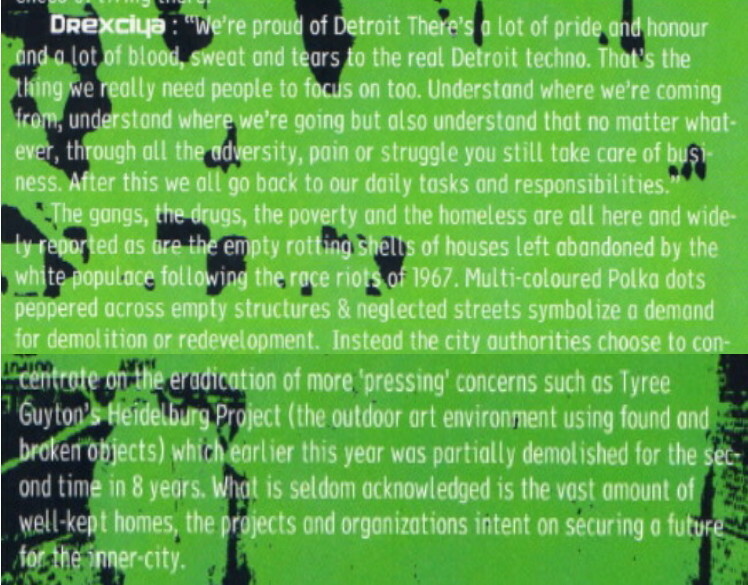 In fact the only album of the eight that does not have a variation of this text is Grava 4. Be warned, once you start looking more closely at any of these albums you will start to find things like this! 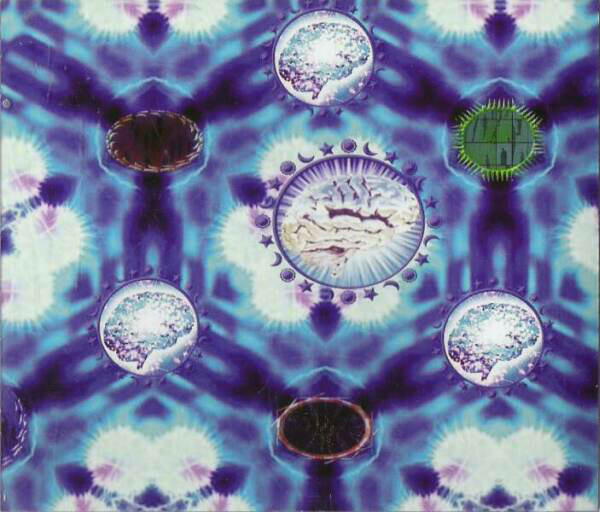 Also in the artwork for L.I.F.E., you will discover seven brains/cells? (below), might these be random or have a deeper meaning to the Storm Series (dimensional brain waves?). I do agree that it is quite odd that L.I.F.E. is not included in the list, as that record must have been fully completed with titles and artwork etc, unlike Lab Rat XL (which is listed) which had to be released without titles or artwork as James Stinson had died before he could complete this. If Grava 4 is really the final album in the Storm Series (which is where I would place it), it would certainly wrap things up quicker so to speak and mean that the Storm contained its own conclusion. There is even a certain symmetry to this with the first and last albums being by Drexciya. The odd album, L.I.F.E., could then be read as some kind of personal sign-off from James Stinson perhaps? 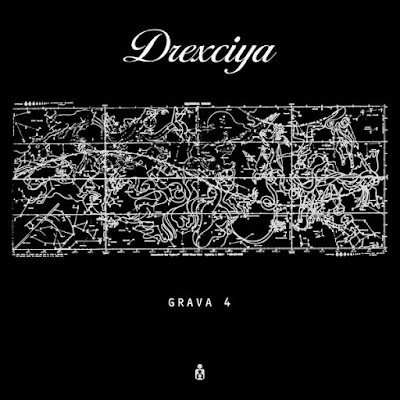 However, as interesting as this is, the whole point of the chaotic nature of the Storm Series in my view was to prepare yourself and discover the Drexciya Home Universe of Grava 4 and it does appear to follow on from the already space located Shifted Phases album. 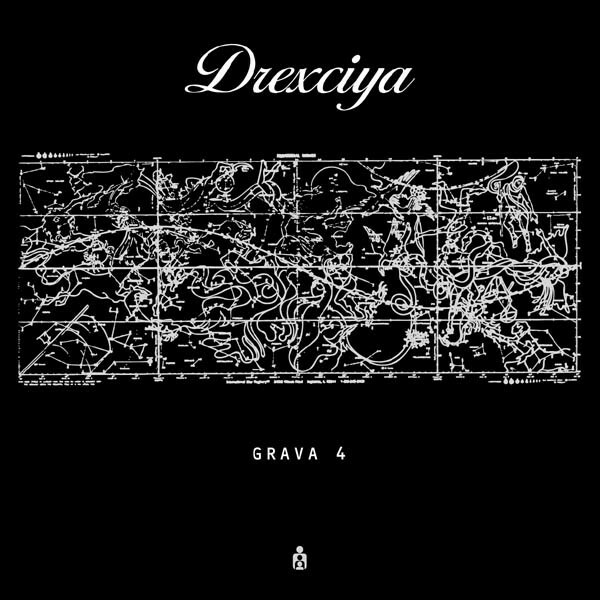 Grava 4 also includes the intriguing text, 'Earth scientist discovered the home planet of Drexciya on 2-14-2002. Within moments Dr. Blowfin was given the orders to initiate the seven dimensional cloaking-spheres to hide the other three planets from earths view.' 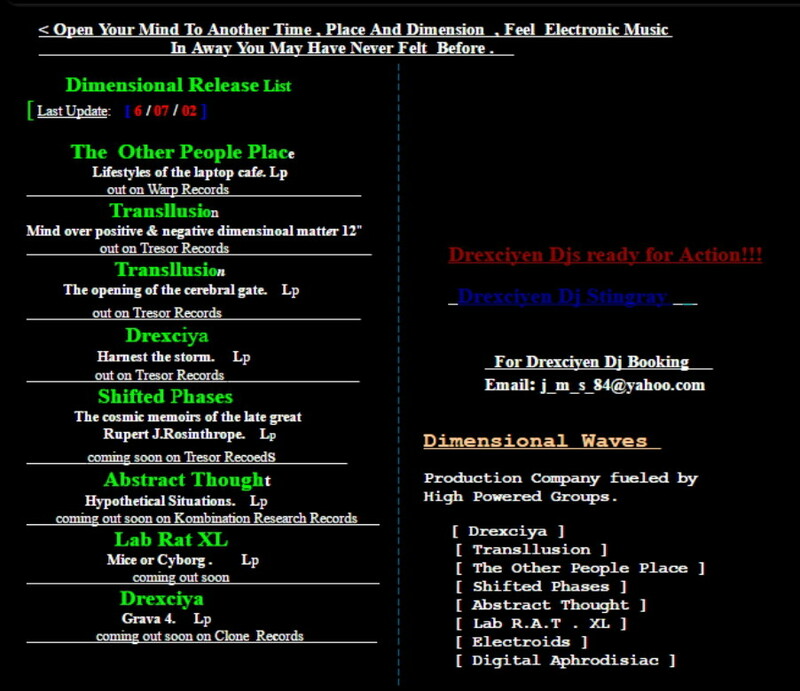 If you take the 'seven dimensional cloaking spheres' to be the seven albums produced under the name Dimensional Waves, this text very much connects Grava 4 to the Storm Series, but is it looking back at the previous seven albums or is it the seventh and final album of the series itself? You could read the text either way and obviously I made the decision to read it the first way, which might have been a mistake. To me there has always really been eight albums in the series and if I am correct I think Stinson might have thought about them in the same way too. For this reason he may well have told Serge that Grava 4 was part of the series, but meant this in a general way, but whether he actually said it was one of the seven we can only guess or accept what Serge has said as fact. Having thought about this new information and still always only speaking for myself, I still prefer my original order and understanding of the series but accept that it comes with a caveat now. With any great work of art each viewer will find what they want to find and the Storm Series was designed to work very much in this way. I don't know how this will affect other people's opinions and beliefs about the Storm Series but I thought it was important to share this information and point out its pros and cons as I see them. I'd love to hear people's opinions about this, including that it's just great music at the end of the day and to simply enjoy it. Luckily James Stinson spoke quite a lot about the Storm Series and I've compiled all of these quotes below from the Drexciya Speaks post. "Harnessed The Storm is an ongoing process that consists of seven storms (albums) released around the world. So far three of the seven storms have hit earth (Drexciya, Transllusion, The Other People Place). The next four storms are in a holding pattern." “(on Storms) We're really pushing the gas pedal now. I'm working at my own pace now. In the past, I would intentionally slow down to see what other people were going to do, but I'm tired of playing games. Now, I'm happy. This is my pace. Get on the gas, get off the gas and end up in a traffic jam." "There are some principles we have that we can't share with the world. At the moment we're working on unleashing the seven storms onto the world, which are seven albums that Drexciya is involved with that we're releasing into the world under a whole host of names, from a whole host of countries. It started with the first storm, which was the new Drexciya release. Then the second storm was Transllusion, which came out of Germany, then you had The Other People Place LP coming out of England. And now we've got four more storms in the works, coming from places like Portugal. They're just in a holding pattern, just waiting to be unleashed."